Although Scripture cannot be reduced to a mere piece of human writing, there is much to gain by paying careful attention to the historical, literary, and theological dimensions of the biblical text. For this reason, The Cradle, the Cross, and the Crown is offered to the serious New Testament student who seeks to better understand and share God’s word of truth” (2 Timothy 2:15). Across nearly one thousand pages, it thoroughly introduces all twenty-seven New Testament books and closely examines Christ’s incarnation and virgin birth, the heart of His ministry shown so vividly in the Gospels’ Passion Narratives, and the triumphant return of Jesus and our eternal reign with Him as depicted in Revelation. "Simply an outstanding work. Its up-to-date research alone makes The Cradle, the Cross, and the Crown an invaluable resource. Add to this its comprehensive survey of the crucial issues related to New Testament studies, and you have a textbook well suited for the college or seminary classroom." "Among the finest such studies of recent decades in classic matters of New Testament introduction. What sets it apart includes: (1) attention to theology and the history of interpretation; (2) extended presentation of the history of New Testament times and the rise of the canon; (3) appropriate rigor; (4) frequently creative layout features; and (5) conceptual clarity. Beyond an impressive digest of scholarship, it is an appeal to faithful appropriation of the New Testament's message." "Clear, thorough, up to date, and engaging all the contemporary alternatives people are putting forward . . . discerning and judicious. Well done and highly recommended." L. Scott Kellum (Ph.D., Southeastern Baptist Theological Seminary) is associate professor of New Testament and Greek at Southeastern Baptist Theological Seminary n Wake Forest, North Carolina. 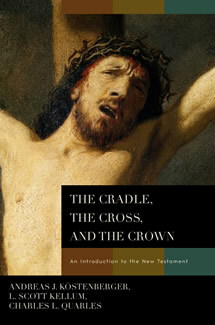 He is the co-author (with Andreas Kostenberger and Charles Quarles) of The Cradle, The Cross, and The Crown: An Introduction to the New Testament (B&H Academic).